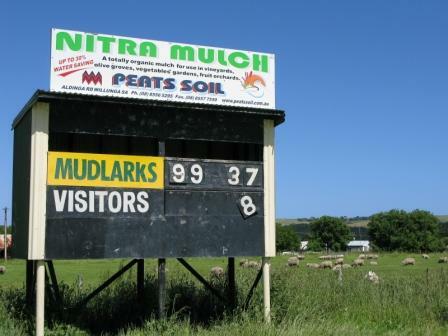 Two unexpected names popped up in relation to this bucolic image of the scoreboard and its optimistic score at Myponga near South Australia’s famous McLaren Vale. Ozzy Osbourne and Bon Scott. Sabbath, fronted by the now even more famous Mr Osbourne, Cat Stevens, who pulled out at the last minute, and cool Hungarian jazz band Syrius. after gaining success with I’ll Be Gone. And over the three days Billy Thorpe and the Aztecs, Chain, Jeff St John and Copperwine (with Wendy Saddington) and Hans Poulsen also performed, along with many others. Taking the stage before Black Sabbath was Fraternity with lead singer Bon Scott. The Myponga Football Club was formed in 1946 and in 2006 merged with a nearby beachtown. Myponga-Sellicks play in the Great Southern Football League. Hopes were high in 2010 when, after a number of lean years, the Mudlarks appointed 1997 Adelaide Crows premiership player Clay Sampson as coach. Success was not immediate.